Registration for the 2019 Annual Conference is now closed. If you are joining us in Warwick, you can find information below or further information on the joining information page. We will be live streaming some of the keynote lectures and sessions during the conference here. The main Conference will take place in the Oculus Building and Social Sciences Department on campus. Delegates can register onto the Conference on the ground floor of the Oculus Building. The registration desk is open throughout the Conference with early registration for delegates arriving on Sunday 14 April between 6.30-7.30pm. Please collect your badges, welcome packs and Gala Dinner tickets at the earliest opportunity to avoid the peak registration time of 10am-11am on Monday 15 April. We ask delegates to wear your name badges at all times for on-site security and access to Conference sessions and events. 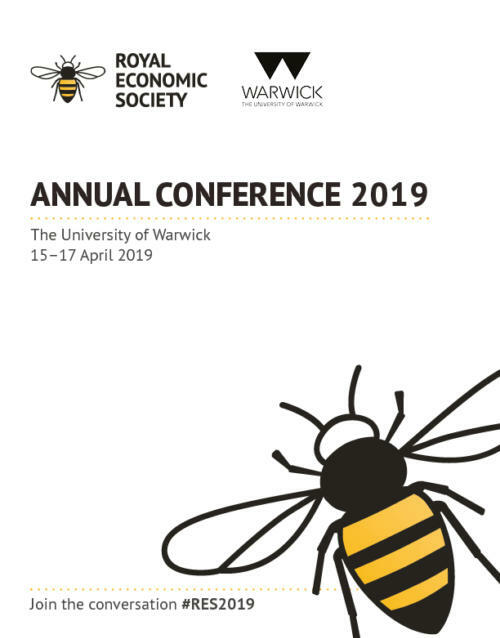 You can download the Conference brochure or access the programme for the 2019 Annual Conference via Editorial Express Print copies will be given out at Conference Registration. Bedrooms are to be vacated by 9.30am on your day of departure. Luggage and belongings should be removed by that time. If required, luggage can be stored in the Left Luggage facility in Conference Reception, Student Union until departure. On the day of departure, keys can be left at Conference Reception (in the Students Union building), Rootes Restaurant (in Rootes Building) or one of the boxes situated in the entrance hall of each accommodation block. Any publisher who wishes to exhibit or advertise at the conference should contact events@res.org.uk. Details of the Phd Financial Assistance Fund can be found here. The RES Annual Conference is open to accredited representatives of print, broadcast and electronic media who are intending to actively report on the Annual Conference. Please see our media policy for further details on how to apply for a media pass.